This gold strip carries the Latin inscription: "Rise up O Lord, and may thy enemies be dispersed and those who hate thee be driven from thy face." It has two sources, the Book of Numbers or Psalm 67, taken from the Vulgate, the Bible used by the Saxons. Several sword fittings discovered in the hoard exhibit artwork known as Salin's Style II. This style of animal-related artwork showed beasts intertwined in complex, symmetrical patterns. Examples of this style were also found at Sutton Hoo. Anglo-Saxon helmets are very rare - only four helmets like the one from which the above cheek plate is taken have survived. Despite the intricate artwork, this helmet, held by Terry Herbert, who found the hoard, would have been used in battle, the decoration marking out the wearer's status. 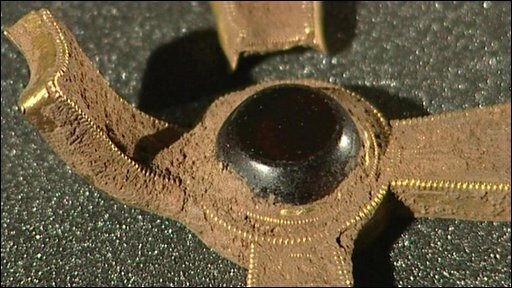 The UK's largest haul of Anglo-Saxon treasure has been discovered buried in a field in Staffordshire. Experts say the collection of 1,500 gold and silver pieces, which may date to the 7th Century, is unparalleled in size and worth "a seven-figure sum". 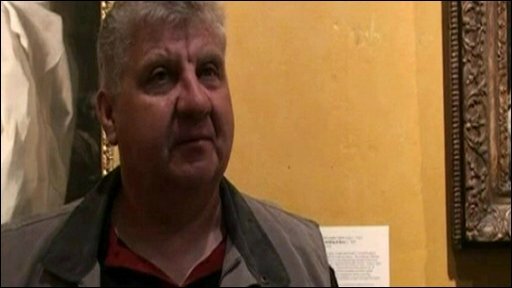 Terry Herbert, who found it on farmland using a metal detector, said it "was what metal detectorists dream of". It could take more than a year for it to be valued. Leslie Webster, former keeper at the British Museum's Department of Prehistory and Europe, said: "This is going to alter our perceptions of Anglo-Saxon England as radically, if not more so, as the Sutton Hoo discoveries. "(It is) absolutely the equivalent of finding a new Lindisfarne Gospels or Book of Kells." "I have this phrase that I say sometimes; 'spirits of yesteryear take me where the coins appear', but on that day I changed coins to gold," he said. "I don't know why I said it that day but I think somebody was listening and directed me to it. "This is what metal detectorists dream of, finding stuff like this. But the vast amount there is just unbelievable." Terry Herbert: "Is there anything better than this to be found?" "Being a partner in one of the most exciting archaeological discoveries of our time is something we can all be proud of," he said. Copper alloy, garnets and glass objects were also discovered at the site. Duncan Slarke, finds liaison officer for Staffordshire, was the first professional to see the hoard, which contains warfare paraphernalia, including sword pommel caps and hilt plates inlaid with precious stones. He said he was "virtually speechless" when he saw the items. "I saw boxes full of gold, items exhibiting the very finest Anglo-Saxon workmanship," he added. Roger Bland, head of portable antiquities and treasure at the British Museum, said: "The most we can say is, I think we're fairly confident it is likely to be a seven-figure sum." The collection is currently being kept in secure storage at Birmingham Museum and Art Gallery but a selection of the items is to be displayed at the museum from Friday until 13 October. Dr Kevin Leahy, who has been cataloguing the find for the Portable Antiquities Scheme, said it was "a truly remarkable collection". "All the archaeologists who've worked with it have been awestruck," he added. "It's been actually quite scary working on this material to be in the presence of greatness." "We also cannot say who the original, or the final, owners were, who took it from them, why they buried it or when. "It will be debated for decades." How did experts work out how much the Staffordshire Hoard was worth? What happens to the hoard now?